By default, Terminus uses its custom shortener to shorten all your URLs. But you can also use your own Bitly account instead. While in your project, navigate to Settings -> Shorteners and click Connect a Bitly account. You will need to be logged in to your Bitly account before you see this screen. 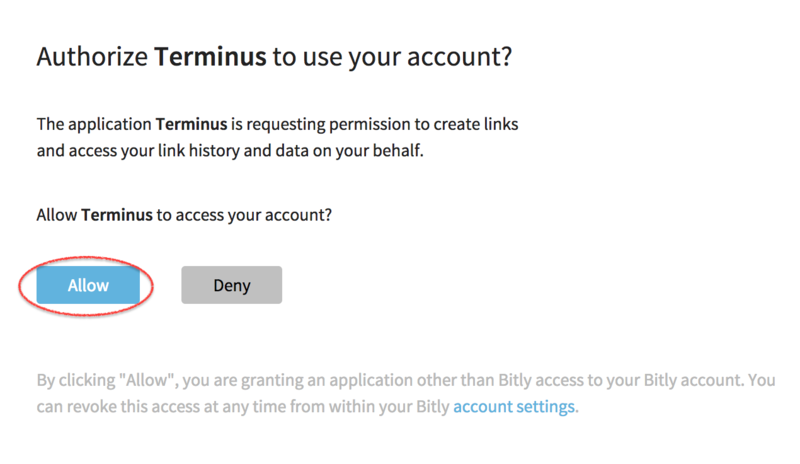 After you click Allow, your project will be connected to your Bitly account. Make sure that In Use is selected. Any new URLs will now use your Bitly account for shortening. If you need to use your Bitly account for more than one project, you’ll need to connect each of them individually.